We will be visiting Myanmar in mid-May. Getting a visa seems to be a huge hassle. If you want "express" (same day) service you have to be at the embassy in Bangkok by 9 AM, which means leaving Korat the night before. And, if you don't manage to get "express" service, you're stuck in Bangkok for two more days waiting for the visa. Or, I guess you could come back to Korat and then go pick up your visa a couple of days later. I'm not sure my GF can get three days off work in order to get the visa. I wrote about this few months ago but post was lost because of hacking. I went in May last year. Thai people can use an agency. NOT FOREIGNERS TO WHAT I KNOW UNLESS THEY CHANGED POLICY. Yes, you can go and use the express service. You will get on same day. Give me one hour, I will try to retrieve info I posted, pictures and others. I got my post from GOOGLE cache !!!!!!!!!!! Now, I must find the pictures.. 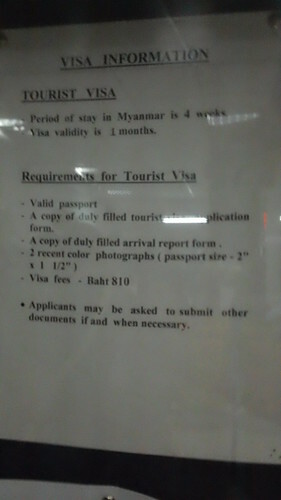 If you are a foreigner and want to travel in Myanmar, you will need a visa. We made a search and were told that foreigners have to apply in person at the Myanmar embassy in Bangkok. My wife (Thai) used a travel agency and got her visa without going in Bangkok. If you go by BTS, it's near Surasak BTS Skytrain. But their information is false. I got my visa same day I applied and it was not difficult. 3) You must apply in the morning and pay the fees. It's about 810 baht. And you will pick up your visa on the next working day, in afternoon. But if you want to express service, same day, you will pay around 1,200 baht. And that's about it. The travel agency of my wife asked about 1,300 baht, including service and embassy fees. So, worse case scenario you are going to spend two nights in Bangkok. The night before so you can get to the embassy early and then the next week if you don't manage to get Express service. I took a bus early, at 6am about. I arrived at mo chit, maybe 9 or 9:30. maybe 10. It was really full. I had my passport, pictures, money. I took a form there and filled it. I paid more to get express service. I picked it up in the afternoon. And you will see the cue of people on flickr and what it looks like from outside. There was a BTS not far... I walked, maybe 10 minutes to come back. But I went there on a motorcycle taxi (NEVER AGAIN) because I didn't want to be late and wanted on same day. These are all my pictures and videos. I'm not sure I want to chance going early the same day. I understand that if your visa takes more than one day you do not have to pick up your passport in person. So, if the Express visa doesn't work (I think they only do a limited number per day) then I could have someone pick up the passport for me. I did it in one day. You save hotel, others. But I left at 6am. They will ask you a reason why you want it on same day. Mine was easy at that time, I told them I was flying next week (if I remember) also that I was living 250 km away and had meetings on X day. All was true. No question were asked. My wife did it through an agency for the same trip. She didn't go to embassy. She is Thai.... maybe rules have changed. Check on internet. That was my visa with some personal details deleted. My GF learned from a Thai language forum that the Embassy of Myanmar has reduced the visa application hours to morning only. The thread contained a photo of the new sign showing morning only. Thanks for info. The picture I took was taken outside the embassy, last March 2011. I go back in May or June but I think you will update it for us before!! They opened the doors promptly at 9:00 AM. The process is a bit unorganized, but I was out of there by 9:30. At first they didn't want to give me a same-day visa, but when I explained that I lived in Korat, they agreed. 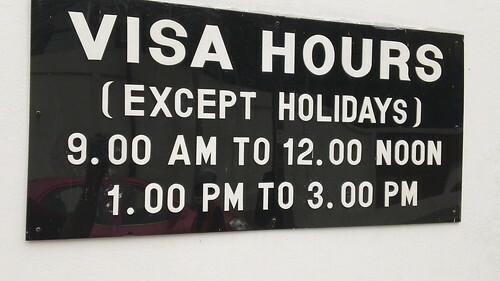 Same-day visas are 1260 baht. 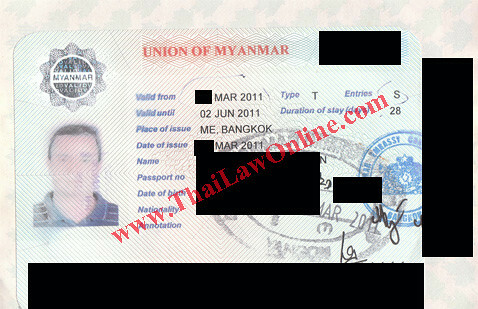 Next-day visas are around 1000 baht and two day visas are around 800 baht. As you can see, the embassy accepts visa applications only in the morning now. And, they no longer issue the fancy visa stickers; it's just a rubber stamp. Visa form. Print on one sheet of paper. I went on a Thursday this time, maybe 10:00am. There was NOBODY before me. I filled my application form (make a copy of your passport, bring your airplane tickets for express services and two pictures). I got the visa on the afternoon, no problem, easy. Same fees. I paid 1210 baht (if I remember) for express service (same day). There is NO DEPARTURE TAX anymore in Yangon. They abolished it. But in many places, you pay a fee of 10$ US for all the sites. For example, you pay 10$ in Bagan. The ticket is good for 1 week, any temple. (They do not ask it). And same in Mandalay (10$). In Mandalay, they DO ASK tickets. Not sure about Yangon because I was just few hours there this time. I believe we should follow Aung Sang Suu Kyi and call it BURMA!